Hayes Grier Was Here – In Burbank!! Los Angeles Chamber Orchestra: Mozart & Beethoven Tonight! Tickets still available for LACO’s concert tonight. Royce Hall tonight pm. 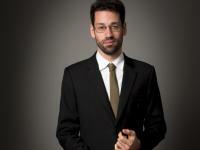 Join Los Angeles Chamber Orchestra and pianist Jonathan Biss for intimate performances of music by Mozart, Beethoven, Ruth Crawford Seeger and a world premiere from Sound Investment composer Sarah Gibson. Mozart’s beautiful composition in three movements: Piano Concerto No. 17 in G major. And Beethoven’s iconic Symphony No. 5. This will be a beautiful evening of beautiful music by two beloved composers. Join in and get social with us! This is the oldest Bob’s Big Boy in the Country. Classic Car Lovers come from all over Los Angeles to display their classic cars. Open to the Public. Since 1998, professional and new writers meet each week at Barnes & Noble Cafe where each get 10 minutes to read and two minutes of constructive feedback. Note, this is through Sunday, December 22, 2013. We are looking for enthusiastic writers who know Burbank. Send us an article of a person, place or thing in Burbank! © 2019 My Daily Burbank. WordPress Theme by Solostream.